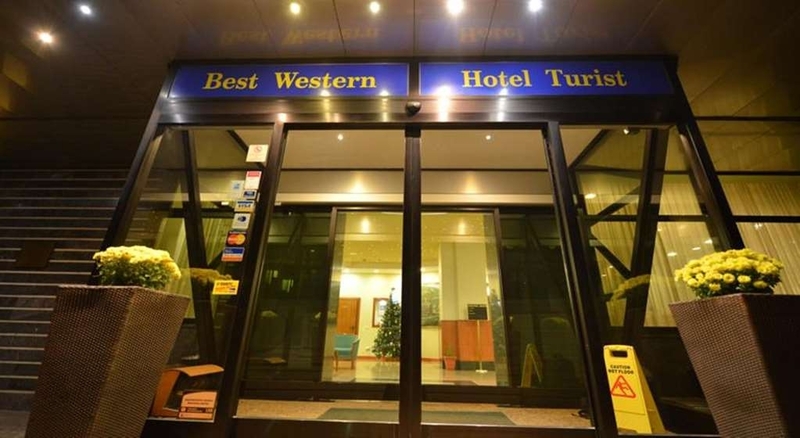 El Best Western Hotel Turist se encuentra en el centro de Skopje. Venga y disfrute de las mejores atracciónes turísticas cerca de nuestro hotel. Precios bajos garantizados y ofertas exclusivas. Situado en el centro de la ciudad de Skopie, el BEST WESTERN Hotel Turist ofrece a los viajeros los más altos estándares de alojamiento de las cadenas internacionales. El BEST WESTERN Hotel Turist ofrece todos los servicios para que disfrute sus visitas de negocios y de placer. 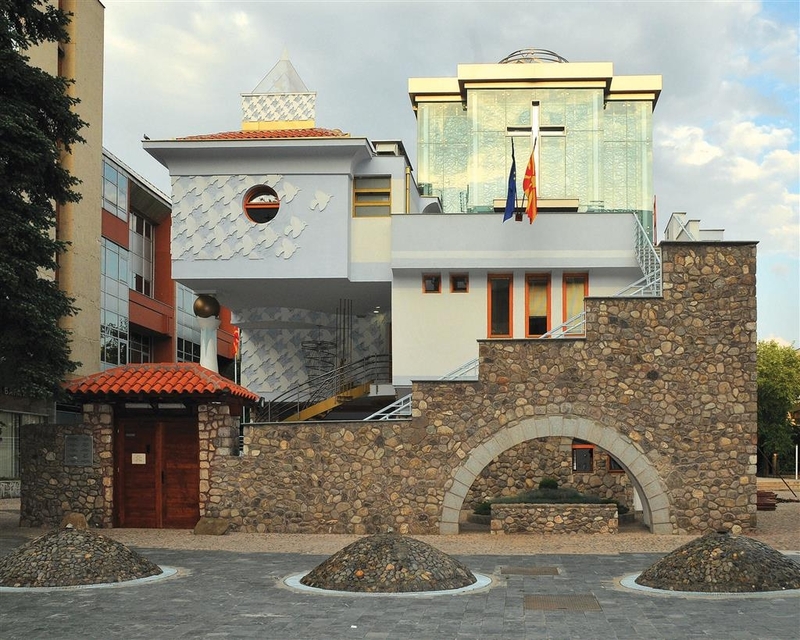 Los huéspedes que se alojen en este hotel de Macedonia estarán situados a poca distancia a pie de las principales atracciones de Skopie, entre las que se incluyen el Parlamento, la casa de la Madre Teresa, el nuevo Teatro, centros comerciales, cafeterías y restaurantes. Nuestro hotel ofrece un total de 74 completas habitaciones equipadas con televisores con pantalla plana y canales por cable y vía satélite. Los huéspedes podrán disfrutar de cocina internacional o local en el restaurante del hotel y la cafetería ofrece todo tipo de bebidas. Entre otros servicios e instalaciones del hotel se incluyen un gimnasio, estacionamiento gratuito frente al hotel y estacionamiento a petición de los interesados en unas instalaciones cercanas, cambio de divisas, instalaciones para banquetes y salas de reuniones con aforo para un máximo de 80 personas con un completo equipamiento técnico y servicio de refrigerios. El BEST WESTERN Hotel Turist está a sólo 500 metros del Casco Antiguo, el centro de la ciudad que ofrece a los visitantes hermosos lugares de interés y la cultura local de Skopie. La Ciudadela "Kale" ofrece una hermosa vista de Skopie a solo 1 kilómetro del hotel. Los visitantes del hotel también disfrutarán de los paseos por el Antiguo Bazar, lleno de tiendas, atracciones locales y baños turcos. A poca distancia a pie del hotel podrá encontrar igualmente las principales oficinas gubernamentales y sedes de empresas. "For the size, this is very good"
This is not a terribly large room but considering most other European hotels, this is not out of the ordinary. The food is good (free continental breakfast) and it is located fairly centrally to some major landmarks (Mother Theresa museum is right next to it and the Alexander the Great statue is down the street). The Hotel is Just for one star:( never agen in this not clean and not service Definitely a very old hotel with no service, bad food, and I would not recommend it anyway hotel, except in the center, there is no parking, there's no way you're in jail!!! Spent 4 nights in this hotel. Room was spacious and clean. Personally I would have changed its name to " Economical Hotel ". All necessities were scars. Only electric kettle and 2 glasses but no coffee, tea and sugar. Arrived very late in the evening and having taken one small bottle of mineral water from the mini bar we were charged 200 dinars (approx. 3 euros 14 cents ) whereas if we have bought it from the small shop down the road it would have cost 25 dinars. Breakfast was poor sometimes not even cereals. The only positive thing about this hotel is that it is located in a pedestrian road and a few steps away from the main square. 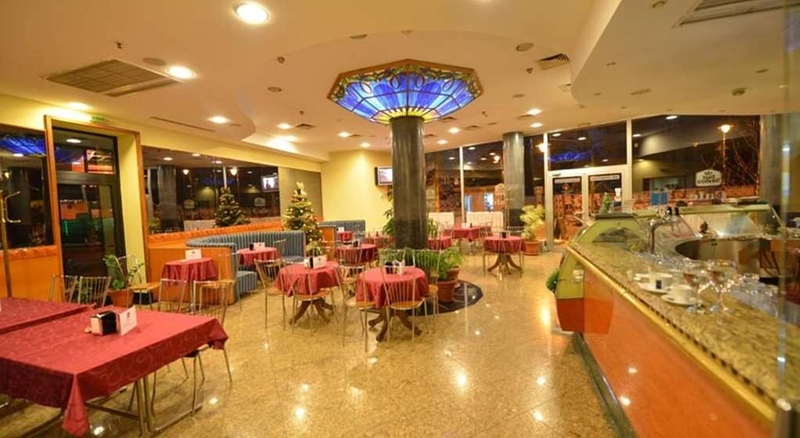 This hotel is located very close to the central plaza of Skopje, Macedonia. The staff is helpful and the breakfast staff was very nice. 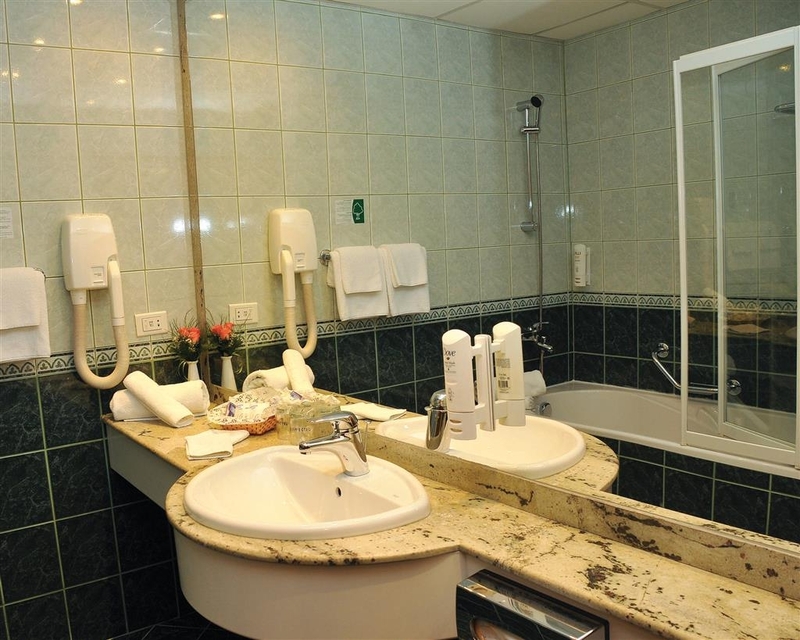 However, the hotel is a bit tired, the carpet is frayed, the shower was a bit like a hose, There was not enough toilet paper, and even though there was a water warmer, there was no coffee or tea. "Hit the Jackpot in the middle of Skopje!" This is one of the few cases that my overall hotel experience far exceeded my expectations. 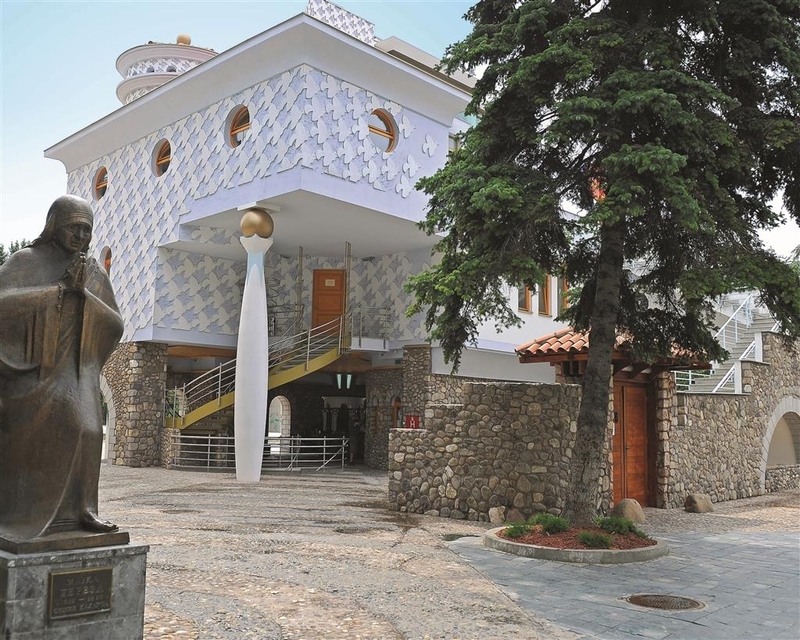 The hotel is situated right on the main shopping street of Skopje, just a few steps from the Mother Teresa Memorial House (where the free city tour started from). The room was one of the best I have stayed in. The bed was just the way I like it and they even have two choices of pillows. Good water pressure in the shower, which was needed after a day of walking and sweating. Also, there was a minibar where I used to put my beers in. The Wifi was perfect and the room was quiet even with the AC on. The price per night was very low considering the great room and location I got. "Location is the only plus"
Best Western Hotel Turist only has one thing going for it and that is the location in the center of the city by Mother Teresa 'a chapel. The hotel may have been great at one time but is very run down. There is only one elevator and they do a lot of tour of your business so be ready to walk up and down the stairs. The breakfast buffet is missing a toaster Among other things.They have sliced bread but no toaster. This morning they ran out of muesli and said they had not been able to go to the store to buy anymore. 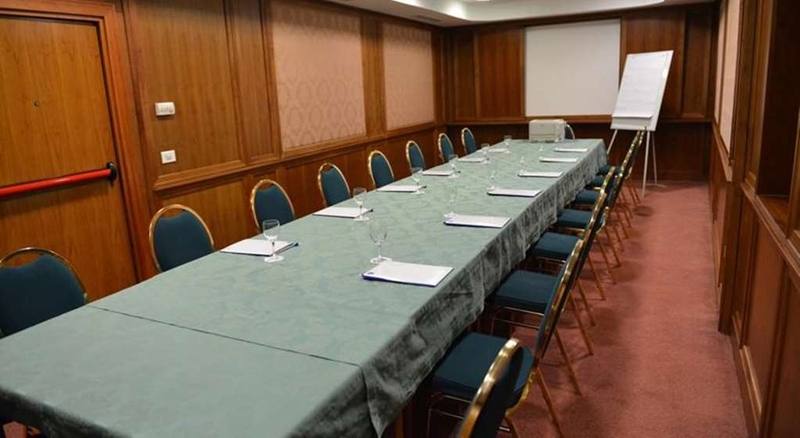 "Good location, reasonable price, nothing else good to say"
The hotel is located on the pedestrian street, 400m from Macedonia Square. Location is excellent. Old Hotel, small rooms, dated. If place to put your head is the need, this is a good choice. Otherwise, not. In the heart of skopje. On the walking street. Large rooms basic setup. Clean restaurant vry poor selection of breakfast. Buffet but the hot dishes were cold. Staff is average nothing special. Few smiles only. Rest sraff speks only local languages. Rooms are ok but but breakfast offer is really poor and it was the same every day. Wifi signal is low but its usable. Shower is very small. Rooms are warm so its ok at winter. 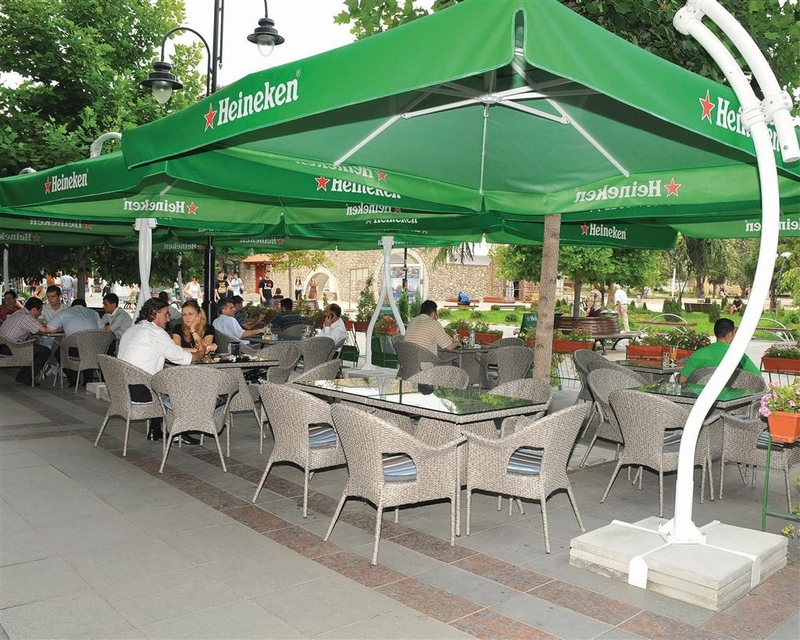 Location is great, its located in centar of skopje only few minuts walking to main square. "Spacious with a central location"
Quite spacious rooms in a very central location. Entrance to the hotel is from an alley though. 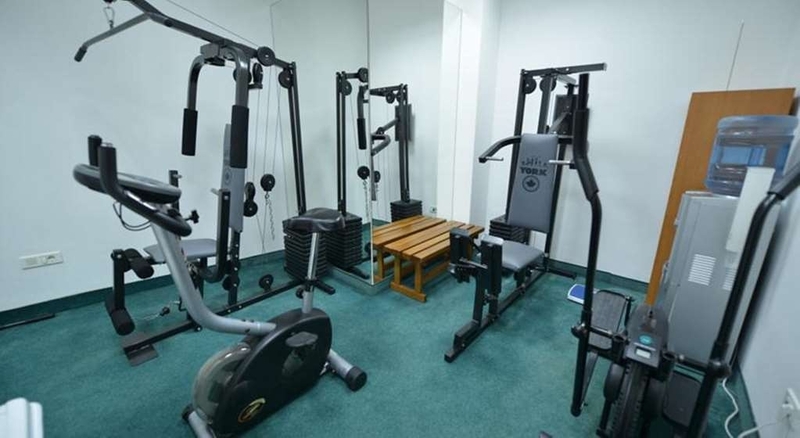 Gym is a small room where most machines are broken. Front staff are helpful and try to speak English to help you understand. You cannot beat the location for the price with this hotel. If you do not need luxury and are looking for a convenient downtown location, look no further. It is not exactly early to find if you are driving as it is in a pedestrian zone but once you find it you will discover how central and convenient it is. The rooms are average. Nothing special. Breakfast was average. Nothing special. Staff was warm and accommodating. Recommended. "Handsome City-Center Room Priced Right"
Dragging myself to reception around 11 pm on a Tuesday, I was welcomed by gracious, efficient desk clerk who offered me a modern 4th-floor single, with breakfast, for 58 euros. Open french doors overlooked lively pedestrian-only Macedonia St. across from Mother Theresa Memorial House and St. Constantine & Elena Church. About 1000 feet to sprawling, glitzy Macedonia Square. 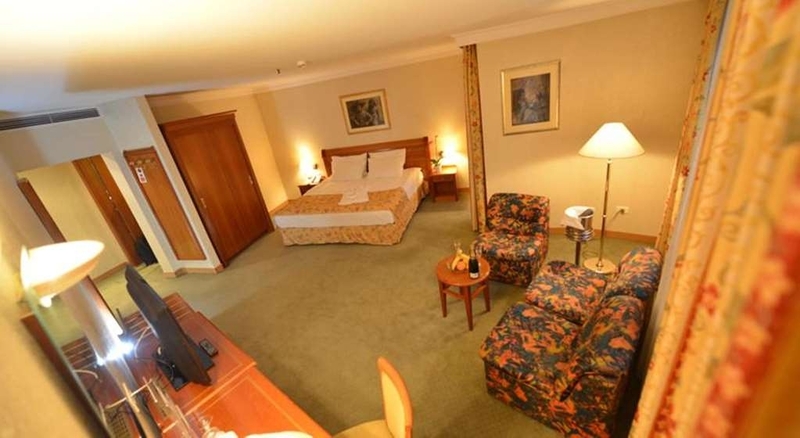 Spacious room, queen bed, impeccably clean; contemporary decor & latest fixtures. Street-front cafe off lobby. Before leaving, I used computer room, and helpful desk clerk arranged for taxi to bus station that cost 70 dinars (approx. $1.15). If every “turist” hotel was like this one then the world is a great place to stay. Two block from the Macedonian square on the main pedestrian street. 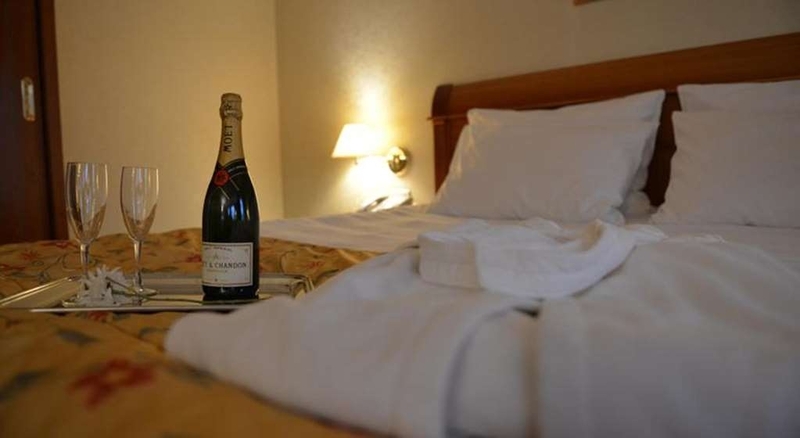 Modest, bit hidden building, professional front desk, decent rooms, which are well maintained, but not fancy or modern. All is clean and working. A good place to stay as a tourist in Skopje. 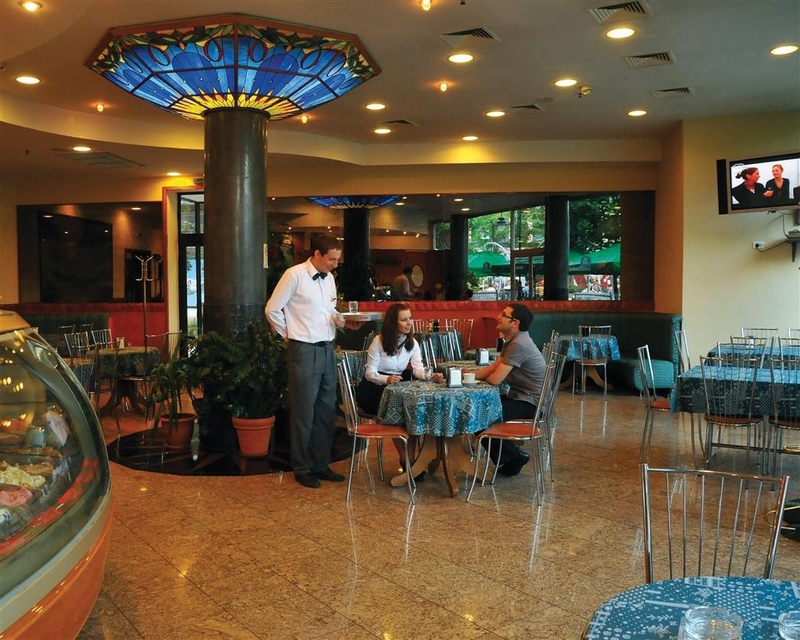 The service is pretty good, and the food is also traditional Macedonian. The rooms are satisfactory, but the water boiler was quite dirty and left particles in the water afterward. Free wi-fi is a plus. We ended up here at the weekend after we arrived at 1.30am to our booked hotel at Matka Canyon and they wouldn't welcome us in. Thankfully Best Western Turist took us in at 4am. We were tired from a long travel and full of anger at the hotel at Matka Canyon. The bed was comfortable but the duvet didn't reach either end... which made for a bit of tackling in the night for enough coverage! Shower was spot on. As was location, TV and staff. Grateful to them considering the circumstances! Solid hotel just two minutes walk from the main square. Friendly and professional people at the front desk, decent rooms, which are clean and you can make your tea / coffee. Breakfast was very basic. This Best Western is a place where you can safely stay over the night and the price was about four times less expensive then nearby Marriott. Hotel is located centrally without traffic around. Had a room on the first floor which had good size and was well maintained. Stairs are well usable, elevator was out of order. Free TV program is quite impressive, although a number of programs was unfortunately without sound. Breakfast buffet is ok but too expensive, breakfast from menue is much cheaper and was sufficient for me when not too hungry (English breakfast for 3€). Service is friendly just you need to be a little patient. So quite a good mid class hotel. "good hotel helpfull staff great location"
we stayed one night at this hotel for a tour of the city center. The hotel is located on the pedestrian road which leads to the stone bridge. Just hundred meters to the stone bridge and all the interesting sights . Pleanty of restaurants arround . The room was comfortable. The staff was very helpfull. "Pleasant stay - awesome central location, friendly staff, good value"
The location was great - on a pedestrian mall just across from the new Mother Theresa visitor's center, but just a couple hundred feet from streets at either end where friends could pick me up. 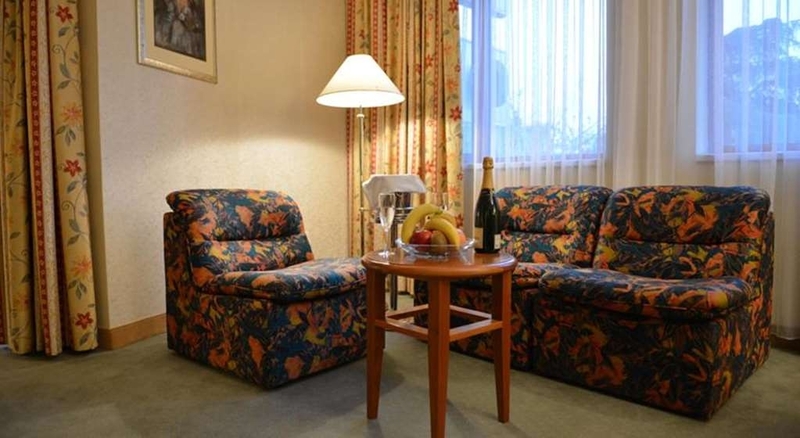 5 minute walk to the heart of tourist attractions and about 15 minutes to the Old Town. The front desk staff were great - especially Ivan Milovanovic - who was not only friendly but made sure my stay was truly comfortable. The rooms are a bit dated, not huge but comfortable. Having a mini-fridge and a coffee maker made it good - especially as breakfast was not included. While there are less expensive hotels to stay among major chains where you can get hotel points and build up your loyalty club profile this was the best best and I would definitely stay there again if my travels brought me back to Skopje. The location was great, just a short walk from the city square. Parking was as convenient as could be. The rooms felt a little dated, but were spacious and uncluttered. The biggest complaint is that housekeeping walked into our room at 7 AM without knocking. That was a low point for the entire trip. 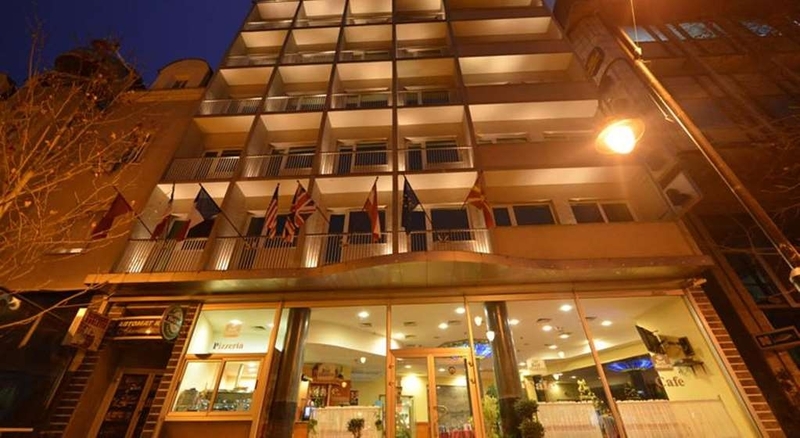 Hotel is in the heart of the city center. All attractions and business are at walking distance. Rooms are big and clean. Stuff at the reception is kind and professional. Breakfast is excellent and fresh. Great hotel for low price. 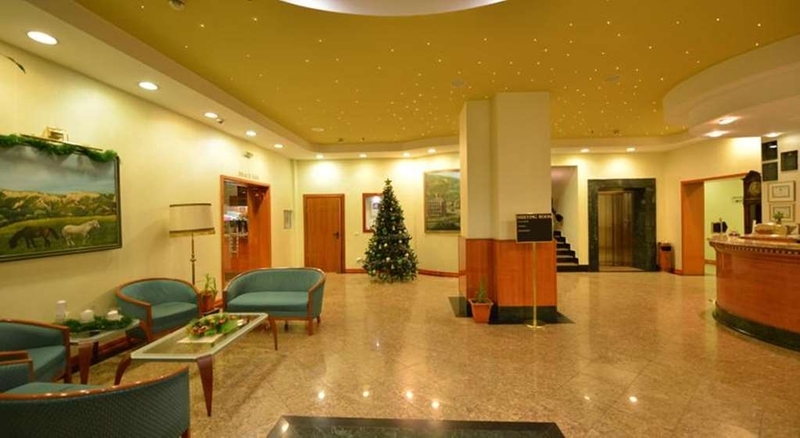 An excellent hotel for those who want to be closer to the city center. Hotel staff is very professional and friendly. Yummy breakfast! I visited the hotel with friends and we were all pleasantly surprised by the appearance. "Great hotel with great location !!!" Hotel has great location,in the center of the city. All business near by at walking distance. Rooms were big and clean. Stuff at the reception was great especially girl with name Jiliana. Breakfast was great and fresh. I've been here for 4 nights and everything was excellent. Great thanks to the hotel. 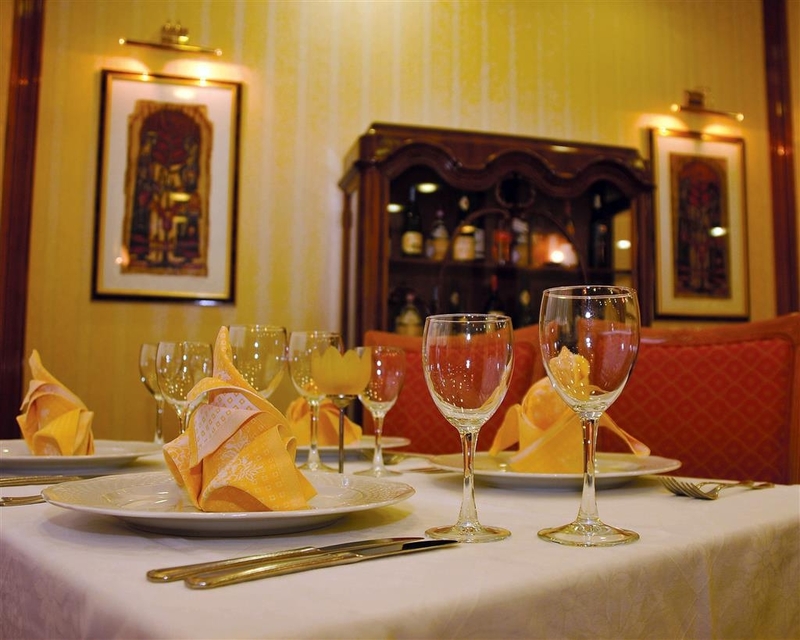 Hotel has a great location; It is situated in the city centre and you can get almost anywhere - on foot. 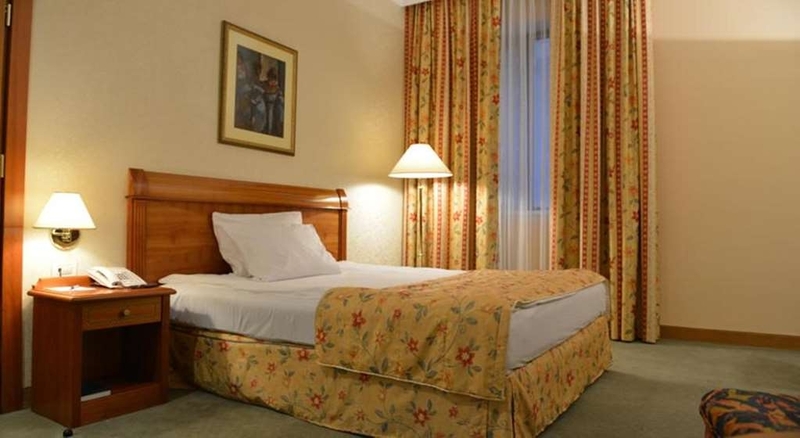 The rooms are clean but small and quite noisy, due to the fact that hotel is on one of the main streets in Skopje. The thing that disappointed me most were quite impolite people working in the hotel and really average food. 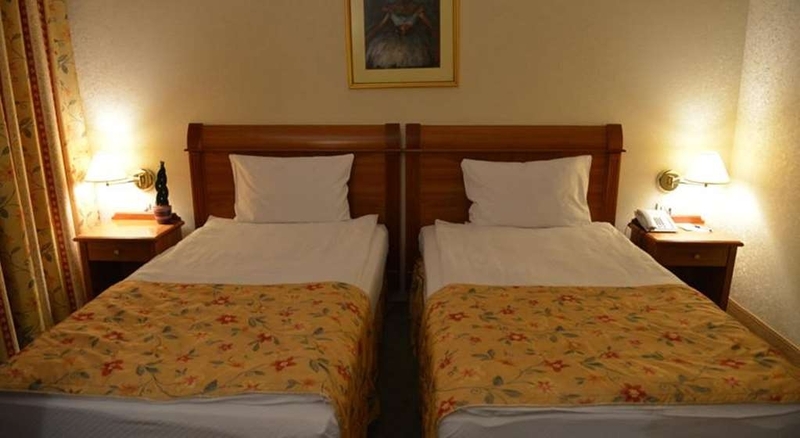 Currently located among the rubble of surrounding building projects, this hotel is perfect for workmen in the building trade. However, even they bring their own breakfast to the restaurant as the offerings there are so poor. If you are her on business or visiting as a tourist and do not want to stay with traveling sports teams or builders, go somewhere else. "Great hotel.Demand of the previous review." Respected , I have been in this hotel few months ago and i will have to disagree with this review because the breakfast was delightful and the staff was great. The location is perfect and the rooms are big and clean. Absolutely the worst hotel stay! A terrible experience beginning with a muddled double booking, continuing with outright lies at check-in, and culminating with an overcharge at check-out. The manager came up with a new definition for the term " breakfast included" - at this hotel it means that the breakfast charges will be added on and included in your bill. The breakfast was one for the books though (and not in a good way). 12 euros for cool aide, watery coffee-flavoured dishwater, fried leftovers from last night's dinner, and a few suspect salads. Having previously suffered from poorly washed salad, I would treat these delights as suspect. No wonder some of the guests brought their own food and drink to breakfast. The hotel should be ashamed to charge 12 euros for this, especially when you can get a freshly cooked breakfast with great coffee at nearby restaurants for 3 or 4 euro. If you do not have very low expectations or do not enjoy staying in a workman' or sportsman's hostel, avoid this place. "Great location, good price near the center of the action." Best Western is located directly across the pedestrian street from the Mother Theresa memorial not far from the central square. Other than a taxi reservation mix-up, everything went well. A restaurant staff member actually walked me to a local street vendor when we were in search of some fruit. here for c couple of nights on a work trip. The front desk staff were helpful and friendly and the room was big and the bed was comfy.. not much else good to say. Breakfast was absolutely awful and felt like a last minute thoughtless add on. No relaxing common areas, reception was very small and uninviting. The cafe area was much under-used and should have been were breakfast was served. My first time in Skopje so i have no way of gauging if this was a good standard in this city or not. "Merkezde Ortadan iyi bir otel"
In the city center. Close to main street and so many restaurants. Personnel is nicely mannered. Rooms are tidy and clean. Breakfast assortment is not much as Turkish breakfast. Location is easy to find back when we went outside. "Pretty good, I'd recommend staying there but not for business"
I was on a business trip for a conference in this hotel, thus it was paid for, but generally, if I were traveling on my own, I probably wouldn't chose this place as it is too expensive, not something I could afford. The place is good and clean and there is free coffee with cream or tea, waiting on the table every morning. I loved that there is an option of a sweetener to sugar, as I cannot eat sugar due to medical reasons. I liked everything in the room and I mean everything. A small tip for people whining that there is no free wifi there (which I was affraid of myself before visiting this place and reading other peoples reviews, as I really needed internet throughout the week that I was staying there.) - the wifi works very well and IS free - the only people who had problems with wifi were those staying on the fifth floor, so my guess is the hotel either needs to fix the routers or place more of them around the place so the net gets everywhere. In addition, it WAS a slow internet of course, especially during the evening, when everyone would want to use their computers - the bandwidth simply didn't stand up to that amount of users - but I didn't expect any better from a free wifi after all. The food is great. Really. I don't know what people didn't like in their food, they had everything and it was a great variety too. Tastes differ of course and I am not a pretentious eater so maybe that had something to do with it, but I really liked the food. I just took a point away for the internet as well as for the conference rooms. Those were awful. They had no windows at all so it was kind of gloomy, no proper air conditioning, seemed like the air wasn't moving. The only thing I absolutely hated in the hotel, along with the business center - the computer is older than my grandmother and if you want to work there forget about it - the printer is black and white and there is no cartridge there whatsoever so there is no way of printing out materials either. Now I wasn't to the gym, though they say they have it so I cannot say anything about that part. I really loved the bathroom. Absolutely perfect, clean, hot water at all times. The staff was really friendly and polite. I appreciate that a lot. With the exception of a few communication mistakes, I'd say they really do their job great. 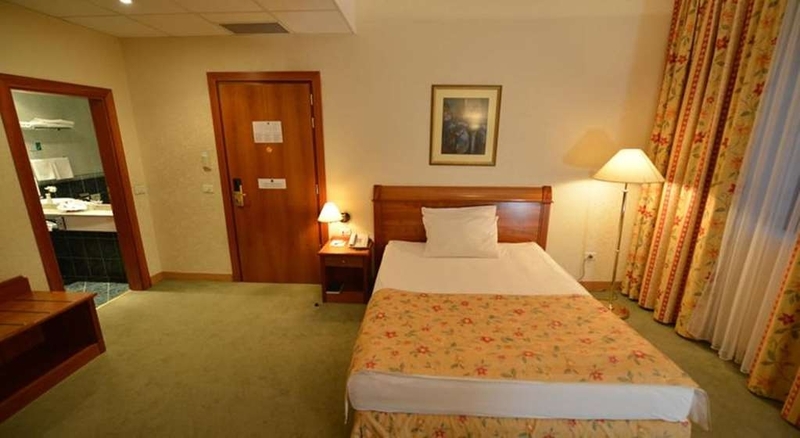 Overall, it's a pretty good hotel, with a great placing - right in the center of the city, fairly easy to find everything there, you get to all of the tourist spots in 5 to 15 minutes tops, by foot mind you. I just wouldn't recommend it for conferences, the rooms were awful. It's not that they weren't clean or messy, they were fairly clean, great furnishing, good projector for presentations - they just had no windows and air was barely getting in - impossible to with in that condition.